Dr. Ryan Sigmon and the team at Compass Dental are pleased to be able to offer beautiful smiles to their neighbors in Hickory and the surrounding communities. Dr. Sigmon has taken numerous postgraduate education courses on IV sedation and implant placement. He also has recent training in hard and soft tissue grafting for the best preparation for dental implants. His commitment to lifelong education means he is constantly evaluating emerging dental methods and technologies in order to provide his patients with the best results in the least invasive manner with a high emphasis on comfort. This commitment ensures the highest level of care, both today and tomorrow. Dr. Sigmon is an active participant in the community, volunteering at Cooperative Christian Ministries and as a musician at his church, Hickory Harvest. 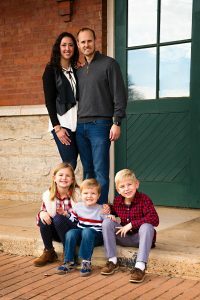 He and his wife Rebekah have three beautiful children, and in his spare time, he enjoys playing keyboard and guitar, engaging in outdoor activities, and spending time with his family. Dr. Sigmon is excited to meet you and discuss your dental needs. Call our office today at (828) 322-6226 to schedule the first step toward your healthiest smile.